Got digital photos? Want to edit them? Got $699 or more for Photoshop CS5? Ouch. Let’s try that again. Got photos? Want to edit them for free? Thought so. Enter GIMP v2.6, a free software package for anyone that wants to edit their photos without breaking the piggy bank. While the software may be free, it isn’t exactly intuitive, but neither is Photoshop. You are going to need some help getting started. Enter Gimp 2.6 for Photographers, another Rocky Nook book by Klaus Goelker. With this book in hand, you will be up to speed editing your photos in short order. This book is not intended to be a reference guide to Gimp 2.6, but rather a series of “learn-by-doing” examples that show the reader the most frequently used features of photo editing. You’ll learn the basics of opening or converting file formats, scaling, cropping, setting contrast and levels… all the basics. But then it gets good. Goelker give instructions on using the clone tool for touch-ups, masks for combining images, as well as rescuing over and underexposed images. Just because Gimp is free, don’t dismiss it as a lightweight in the photo editing world. Anything but. Goelker goes on to show to how to use it and other free plug-ins for HDR, collages, perspective cloning and hand coloring B&W images. There’s even a way to use Gimp Animation to do video editing. Just like Photoshop and Adobe’s Raw Convertor, in the Gimp world you have your choice of UFRaw or RawTherapee – both for free. Yes, free is good and if you know what to do with the software, it’s priceless. Gimp 2.6 for Photographers is your price of admission. 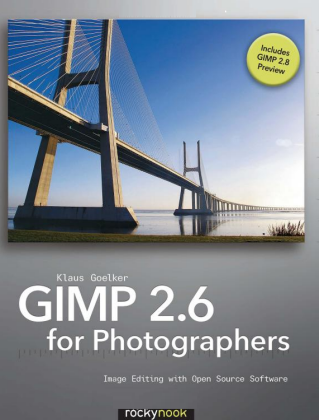 Gimp 2.6 for photographers can be ordered from either Rocky Nook or Amazon.com.